We're a 5-Star Service Provider! Windy City Paws is licensed, bonded, and insured in the city of Chicago. We currently care for over 300 clients in Chicago and have over 50 dog walkers. We have a thorough screening process for our dog walkers which include a background check and extensive training to become a member of our team. We offer easy online scheduling for clients! All of our services are GPS verified. Clients receive an email in real time with a summary of the visit with a photo of their pet from that day! 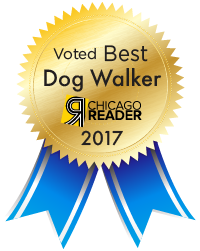 We also provide all Chicago dog owners with an excellent resource of information through our PawsFirst Blog, including articles about the Chicago Leash Laws, Dog Park Guide & Best Dog-Friendly Patios.